If you are looking for the modern RuneScape guide for this content, please see our A Fairy Tale Part II: Cure a Queen guide. The Fairy Queen should be awake and back in charge of the Lost City by now, but what is happening in Zanaris? Why hasn't the Fairy Godfather abdicated the throne? What is happening to all the fairy inhabitants and where has Fairy Nuff gone? Can you rise to the challenge of using the fairy rings to search the other planes and Cure a Queen, in the second part of the Fairy Tale trilogy? 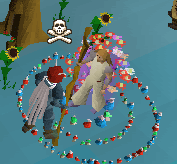 Begin by speaking to Martin the Master Gardener, north of Draynor Market. To start this quest, speak with Martin the Master Gardner, over by the pig pen in Draynor. You'll ask about his crops, and he'll tell you that he hasn't had time to harvest them. Go do something else and come back in a while, and he'll complain that the crops are getting worse, and it's all your fault! Time to get out your Dramen Staff and make the short walk southeast to Zanaris. Head west to the Fairy Nuff's room and a cutscene will start when you step inside. It seems as if the room has been totally ransacked, and the Fairy Queen and Fairy Nuff are nowhere to be seen. Take the Fairy Nuff's Healing Certificate from the eastern wall (studying the smashed shelves won't yield anything). If you read it, you see the front side, which looks fairly normal. Studying it will show you the back side, which has strange symbols on it. Head to the throne room and speak with the Fairy Godfather. After talking to him for a while and not really getting anything out of him, he'll tell you to go speak with the coordinator about the "Fairy Rings." Head up the hallway north to find the fairy coordinator. You can talk to her about the certificate, but she doesn't seem to know anything about it. When you ask her about the fairy rings, she tells about the history of Zanaris, and how it's a nexus between all the planes. (Yeah, doesn't make much sense in the context of Runescape to me, either) She says that there are three rings in Zanaris - One in the market, one by the entrance, and one by the fountains (the strongest one). Head down to the Cosmic Altar. If you go to the south wall, you'll notice a small sign. If you read it, it's written in the same language as the writing on the back of the Fairy Nuff's certificate. The sign says "Cosmic Rune Altar." If you want, I think you can just skip actually doing the cryptogram and do the rest (you can't do the other stuff before even looking at the sign, though). If you're curious how to do it, I'll include help for that at the bottom of the guide. The message says: "The Godfather attacked us. We have fled to safety. If you are loyal to Her Majesty, find us by using coordinates AIR, DLR, DJQ, AJS." Head north, until you see a transportation sign on the minimap. Here's the Fairy Ring. When you use it, it asks for three coordinates, and what you enter determines where you'll go. Use the coordinates from the message in the Fairy Ring. 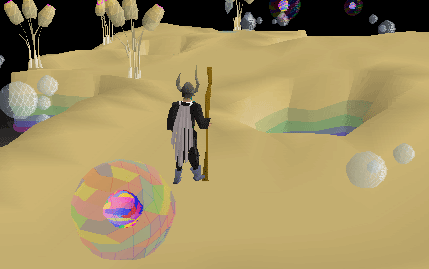 Don't worry if you don't get sent to very encouraging places - you'll go to an island near Ardougne, a swamp, practically nowhere, and then to where you want to go. You'll find yourself in another part of Zanaris. Head up the pathway and go east, into a hospital-looking room. Fairy Nuff will be in there, talk to her. She tells how the Fairy Godfather has been trying to take over Zanaris, and how the queen was moved to safety. A "Fairy Very Wise" figure will appear and get upset at you for "helping" the Godfather. After talking with her, take the Fairy Ring back to Zanaris. Go back to the fairy throne room and try to pickpocket the godfather. 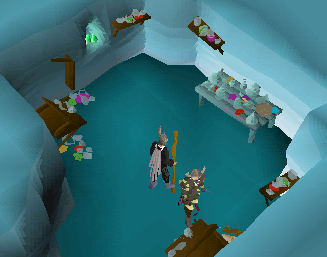 If you fail, you'll get knocked out and wake up over by the 4 adventurers by Lumbridge Swamp. When you finally get them, head back to the alternate part of Zanaris by using the AJS coordinate (you don't have to use the three before it). Talk to the Fairy Nuff and she'll tell you that she needs a Star Flower and a Gorak Claw to bring the Fairy Queen back to life. 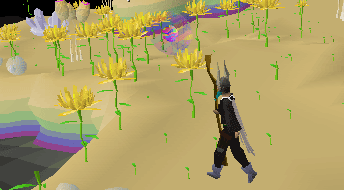 To get the Star Flower, use the fairy ring to go to CKP. Look around for some Flowers that are fully grown, because they grow and die quickly, and pick it. I thought some free players and folks who haven't done the quest might be interested to see the odd scenery in this area. Use the ring to get back to Zanaris. Go to the bank and stock up on any weapons and food you may need to battle a level 145 (protection prayers don't work against them). When you're ready, go to the coordinates DIR. Be careful - as soon as you step out of the fairy ring, the Goraks will attack you. To get them off your back, I suggest going straight north, and go into the cloud bank by choosing "enter-cloud." The Goraks can't attack you in there, so wait until they go away and you can fight one-on-one. After killing one, pick up the claw (and the big bones and coins, if you want) and go back into the fairy ring. Use the newly-obtained claws with a pestle and mortar to grind them up. Use the flower with a vial of water and use the claws with that. 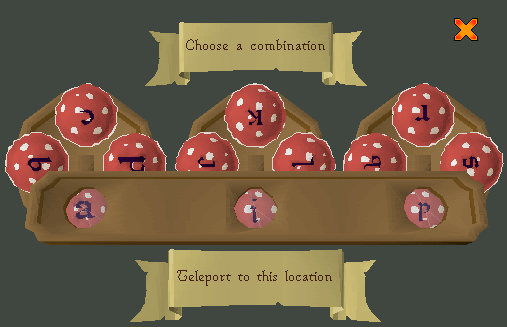 Go back to Fairy Nuff by using the Fairy Ring (combination "AIR, DLR, DJQ, AJS") and tell her you have the potion. Use it on the Fairy Queen and then talk to her, and you're done. First, you'll want to fill in the letters from "Cosmic Rune Altar" into the back of the certificate. Now, we look for some easy words. Look down on the second-to-last row, and you'll see USIN_. What letter could go there besides G? Look at the very first word. The logical letter to put in that space is H, because "the" is a very common word. Look at the second line from the top, the first word. ATTAC_E_. Except for "attaches," which is a word that not too many people use, the only word that can fit is "attacked." 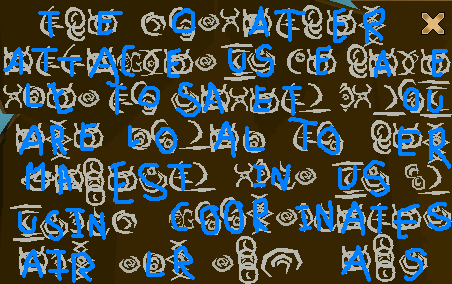 You can fill in the rest of the Ks and Ds in the cryptogram now. Keep going like this and you'll have it done!